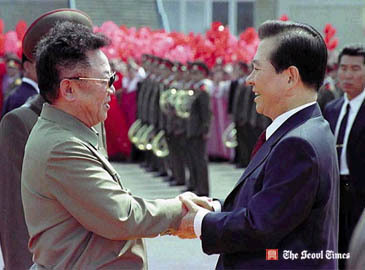 Late President Kim Dae-Jung (right) is greeted by North Korean leader Kim Jong-Il in Pyongyang, North Korea on June 13, 2000 priot to their summit talks. A unified Korea's economy would be bigger than that of Japan or Germany in the next three decades or so, Reuters reported recently quoting US investment bank Goldman Sachs. Reuters journalist Johathan Thatcher predicted that the combined GDP of South and North Korea would surpass that of France, Germany, and Japan in the next 30 to 40 years. The following is the full story. A united Korea — combining Asia's fourth biggest economy with one of its poorest — could surpass that of Germany or Japan in economic might in the next 30-40 years, U.S. investment bank Goldman Sachs said on Monday. Though North Korea's planned economy system looks to be on the edge of collapse, it offers a large and cheap workforce, a wealth of minerals that the resource-poor South currently has to import to feed its industry and the likelihood of gains in productivity and its currency once economic reforms take hold. "We project that a united Korea could overtake France, Germany and possibly Japan in 30-40 years in terms of GDP in U.S. dollar terms," it said in a report. Thw two Koreas have been separated for more than half a century and have yet to sign a peace treaty to formally end the 1950-53 Korean War. The Goldman Sachs report was published just as the communist North has shown signs of being willing to reengage with the outside world, from which it has been all but cut off after a series of nuclear and missile tests this year. It also comes as the conservative government in Seoul has turned increasingly hard-nosed in dealings with its prickly neighbor, ending years of aid until Pyongyang starts to dismantle its nuclear weapons programme. The cost of reunification has long been seen as one of the biggest risks facing the South Korean economy. Many analysts warn the South's rise to an economic powerhouse in the region could be undone by the burden of absorbing its neighbor, whose per capita income is about 5 percent the size. But Goldman Sachs said it could be affordable by having the appropriate policies and by following the China/Hong Kong reunification model which allows two political and economic systems to co-exist, with limited inter-Korean migration. The report was written by the bank's South Korea economist, Goohoon Kwon, and included input from one of the economists who co-authored the bank's influential prediction earlier this decade that the economies of Brazil, Russia, India and China — the so-called BRICs — would turn dominant by the mid-century. It argued that there remained a spirit of reconciliation despite the hardening in Seoul and that the political backdrop in the region was supportive of peaceful and gradual integration. North Korea's increasing lag behind other former planned economies, such as Russia, China and Vietnam, "could eventually spark powerful political and economic changes in North Korea which, with the recent political changes in the U.S. and Japan, could transform the nature and magnitude of North Korea risks."